At the beginning of 1865, General Winfield Scott’s Anaconda Plan was slowly suffocating the Confederacy and only one major port, Wilmington, NC, remained open in defiance of the Yankee invaders. Wilmington’s location made it one of the South’s most successful ports for blockade runners. The city itself lay 30 miles up the Cape Fear River from the Atlantic Ocean and blockade runners had two islets from which to enter the Atlantic and evade the Union blockade fleet. Early in the war, Confederate forces recognized the importance of securing the mouth of the Cape Fear. By 1865, what had begun life as a small artillery battery had become Fort Fisher, one of the largest coastal emplacements of the 19th century, and had been dubbed the Gibraltar of the South. Fort Fisher was shaped in the form of an L with a northern land face and a westward facing sea face. In addition to its fearsome batteries of heavy guns, the fort’s commander, Colonel William Lamb, created a roving artillery unit equipped with advanced breech-loading Whitworth cannon. Colonel Lamb utilized the squadron to drive off Union warships that sought to attack blockade runners steaming through the surf zone or beached during an unsuccessful run. On December 24, 1864 the Union Army and Navy attempted a combined operations attack on the fort, but were driven off thanks to the effective command of Colonel Lamb and the incompetence of the Union ground commander, Major General Benjamin “Spoons” Butler. Less than a month later, on January 12, 1865 a larger, better equipped Union force arrived off Fort Fisher determined to carry the fort regardless of the cost. On January 15, after a 60 hour bombardment, 8,000 Union troops surged forward and captured the fort after a fierce 6 hour battle. 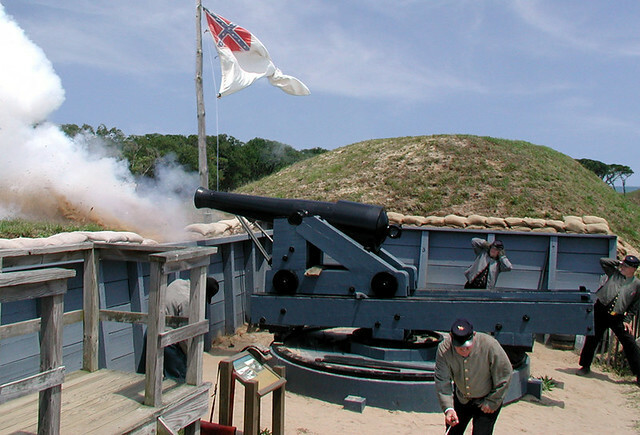 Fort Fisher’s capture sealed the fate of Wilmington and ensured that no more foreign war material would reach General Robert E. Lee’s beleaguered troops in Petersburg, Virginia. Today the sea has claimed much of the fort and what little remains is a museum and historic site run by the state of North Carolina. Visitors to the museum should be sure to stop in at the world-class Fort Fisher Aquarium just down the road.